In the shifting sands of the desert, near an unnamed metropolis, there is an institute where various fellows come to undertake projects of great significance. But when our sort-of hero, Percy Frobisher, arrives, surrounded by the simulated environment of the glass-enclosed dome of the Institute, his mind goes completely blank. When he spills something on his uniform—a major faux pas—he learns about a mysterious shop where you can take something, utter the command “same same,” and receive a replica even better than the original. 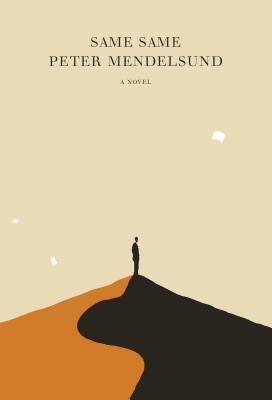 Imagining a world in which simulacra have as much value as the real—so much so that any distinction between the two vanishes, and even language seeks to reproduce meaning through ever more degraded copies of itself—Peter Mendelsund has crafted a deeply unsettling novel about what it means to exist and to create . . . and a future that may not be far off.